4. Department of Breast and Thyroid Surgery, The Seventh Affiliated Hospital, Sun Yat-sen University, ShenZhen, 518107, China. Background: To investigate the role of Programmed death ligand 1 (PD-L1) expression and tumor-infiltrating lymphocytes (TILs) in tumor recurrence and metastasis of Chinese patients suffering from triple negative breast cancer (TNBC). Methods: PD-L1 immunohistochemistry was performed on 215 TNBCs. Also, the prevalence of TILs correlated the expression of PD-L1 and TILs with clinical outcomes. Kaplan-Meier and the model analyses of univariate Cox proportional hazards were utilized to compare the survival of patients with positive PD-L1 expression with those with negative PD-L1 expression. Results: The median follow-up time was 67.7 months (range: 7-159 months). PD-L1-positive breast cancer patients had significantly longer disease-free survival (DFS) and Overall survival (OS) compared with PD-L1-negative patients (P=0.046; P=0.019) in TNBC. The presence of increased stromal lymphocytic infiltrates (STILs) was significantly associated with overall survival (P=0.026). The model analysis of univariate Cox proportional hazards showed that PD-L1 and STILs were independent prognostic factors for tumor prognosis. Conclusions: Our study found that high levels of PD-L1 could be expressed in TNBC, which was correlated with the prevalence of TILs. Keywords: PD-L1, TIL, breast cancer, TNBC, prognosis. The 2015 ACS cancer statistics released by Breast Cancer Account of United States showed that the incidence of breast cancer amongst women (25%) was the first primary of the total incidence of cancer in the Unites States. Particularly, the mortality of female breast cancer had reached 40,000, accounting for 15% of the total mortality . By comparing with the data in 2008, the World Cancer Statistics in 2012 showed that the mortality of Chinese breast cancer had dramatically increased from 48,000 to 697,000 . Despite the progress in increasing the therapeutic regimen for breast cancer, within a decade, distant metastasis or recurrence have occurred to more than 50% patients with invasive breast cancer, resulting in treatment failure . In fact, a 5-year survival for 'triple-negative breast cancer' (TNBC) was only 60% . Thus, it is essential to introduce an innovative treatment approach to the specific patient group. Researches have paid more attention to the function of immunoregulatory receptor programmed cell death 1 (PD-1) and the corresponding B7 family of ligands as a pivotal mechanism of tumor immune tolerance and its escape in cancer. T cell can be activated by two main signal pathways. One way refers to the TCR receptors on the surface of the T cell discern antigen-presenting cells through the expression of MHC molecules that present the antigen peptide. Another is a way through the antigen presenting cells expression of activated molecules with T cell surface receptors to produce the corresponding stimulation signal. Lacking or rejection of stimulus signal would lead to T cells' inactivation [5-7]. In addition to the positive activated molecules, the negative stimulus molecule also widely exists in the immune regulation process which has inhibition function for T cell. PD-L1, standing for the programmed death ligand 1, is an important member of immunoglobulin superfamily negative stimulus molecule to participate in the immune regulation process. PD - L1 is the main ligand of Programmed death receptor 1 (PD - 1). PD-L1 has been found by Ishida el. in an apoptosis research of T cell hybridoma cell apoptosis related proteins . Also, the PD - L1 signaling pathways can suppress the negative regulation of T cell immune response and the immune tolerance for microbial infection and tumor. It has been approved that there is an association between tumor-infiltrating lymphocytes (TILs) express and high PD-L1expression in varieties of cancers [9-14]. Researchers found that CTLA4 expression is associated with the development of breast cancer and PD-L1+TILs are also related to prognosis .With the advances of technology, immune-targeting drugs have been approved to be applied in lung cancer and melanoma clinical applications [16, 17]. However, the PD-L1 expression and prevalence of tumor TILs in Chinese TNBC patients still remain unclear. Today, very limited data on the expression of PD-L1 in Chinese TNBC patients have been reported. This study aimed to search for the relationship among the expression level of PD-L1, TILs and clinical manifestations in Chinese patients with triple negative breast cancer, particularly in the aspects of prognostic value. 31 Breast Cancer Tissue was acquired from the patients in the First Affiliated Hospital of Sun Yat-sen University and 184 Breast Cancer Tissue was acquired from patients in Sun Yat-sen University cancer center, who had undergone surgical resection and had been diagnosed with TNBC. 215 samples (including recurrent and metastatic) from July1999 to October 2012 were admitted by the cancer center review board of the First Affiliated Hospital of Sun Yat-sen University and Sun Yat-sen University. TNBC patients were identified for the tissue microarray (TMA) immunohistochemical staining. Patient's clinical information was collected, including age, gender, tumor location(s), disease status of breast cancer, lymph node involvement and ER, PR and HER2 status. Supplementary information including adjuvant chemotherapy and radiotherapy was collected as well. Slides were stained based on the Immunohistochemistry Protocol (Paraffin) from Cell Signaling Technology (Beverly, MA). Briefly, 5-μm-thick array sections were baked at 65°C for 3h, dewaxed with xylene (two times for 5 minutes each), putted through 100% ethanol (twice for 5 minutes each) and rehydrated through various graded alcohol. Subsequently, the slide was washed with PBS for three times for 5 minutes. Antigen retrieval was coped with Target Retrieval Solution (Dako, North America, Inc., CA). After the antigen retrieval, the slide was rinsed with PBS for three times for 5 minutes. Following the process of antigen retrieval, endogenous peroxidase activity was quenched by incubation in 3% hydrogen peroxide, and the protein was blocked with blocking solution (Cell Signaling Technology) for 10 minutes at room temperature. The concentration of rabbit primary antibody which reacted to PD-L1 (Cell Signaling Technology, Beverly, MA) was 1:100 in Dako antibody diluent; slides were applied at 4°C overnight. Afterwards, the slides were incubated with Ventana Omni Mapanti-rabbit secondary antibody for 60 Minutes. Each step was succeeded by three Tris-buffered saline (TBS) rinses, and the bound antibody on the array was detected by utilizing SignalStain® Boost Detection Reagent (Cell Signaling Technology) and SignalStain® DAB (Cell Signaling Technology). Finally, sections were counterstained with Hematoxylin QS (VectorLaboratories) and the slide was mounted with VectaMount AQ (Vector Laboratories) for long-term preservation. Two independent pathologists had checked all the slides. Both of them had not known the patient's clinical parameters, which eliminated the observation biases. The immunostaining intensity pattern of PD-L1 was assessed based on a scale semi-quantitatively as follows: (1) intensity of the stain: 0, no staining; 1+, weak staining; 2+, moderate staining; and 3+, intense staining. (2) positive cell percentage rate: 0, cells < 5%, 1,5% ~ 25%, 2, 26% ~50%, 3, 51% ~ 75%, 4, > 75%. Scoring was calculated from the mean of the two independently conducted researchers. After the calculation, overall result of staining intensity was recorded as: negative (≤ 1) and positive (> 1). PD-L1 staining images were obtained by utilizing a Nikon Eclipse Ti-U fluorescence microscope (Nikon Corp) with a SPOTRT digital camera (Diagnostic Instruments Inc). TILs were separately scored by two independent pathologists. On the basis of the prespecified analysis plan, the presence of TILs was evaluated by the 200×magnification and semi-quantitatively as below: score 1, TILs-low (range, 0% to 10%); 2, TILs-moderate (range, 11% to 40%); 3, TILs-Marked (range, 41% to 100%). All the statistical analyses were performed utilizing the SPSS statistics software version 19. Kaplan-Meier survival curves were generated to examine the relationship between the expression levels of PD-L1 and the survival rate of patients. Overall survival (OS) was calculated from the date of tumor diagnosis to the date of death from any cause, or time of the last visit. The primary endpoint for this analysis was disease-free survival (DFS) which can be defined as the length of time from the date of tumor diagnosis to local, regional, or distant recurrence or to the date of death from any cause. The statistical significance between the two groups was determined by the usage of chi-square test, or two-sample t-test as appropriate. The statistical significance was described in figures and legends. The significance was set at a p-value of 0.05. Patient characteristics: 215 Chinese patients with TNBC in total were enrolled in our study. The median age at diagnosis was 49.0 years (range: 27-78 years). The characteristics of these patients are listed in Table 1, as shown in which, we collected clinicopathological parameters including median age, stage surgical methods, positive lymph nodes, tumor size, chemotherapy, radiotherapy, neo-adjuvant chemotherapy, Stromal TIL, Intra-tumoral TIL and total TIL. 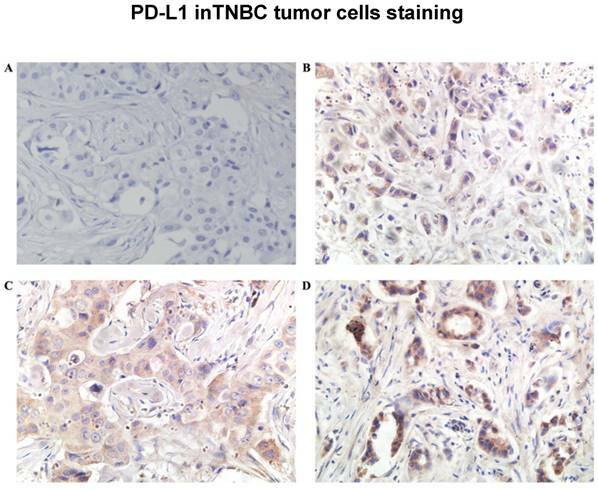 Associations could be found between TNBC PD-L1 expression and STILs, LPBC as well as surgical approaches. PD-L1 was found in the cytoplasm or at the membrane (or both) of tumor cells by immunohistochemical staining (Figure 1). Intratumor PD-L1 expression was observed in 70 (32.6%) patients. Lymphocytic infiltration was observed in most of the tumors. As shown in Figure 1, representative pictures of TNBC cases showed different levels of stromal lymphocytic infiltrates (STILs). Based on the scoring criteria of TILs in the tumor samples, STILs-few patients (range: 0 to10%) were found in 57.7% of the cases (124/215). The number of cases with STILs-moderate patients (range: 11% to 40%) was 25.6% of the samples (55/215). The percentage of cases with STILs-marked patients (range: 41% to 100%) was 16.7% (36/215). Few Intra-tumoral TIL (ITILs) patients (range: 0 to10%) were found in 93.5% of the cases (201/215); ITILs-moderate patients (range: 11% to 40%) were 5.6% of the samples (12/215); ITILs-marked patients (range: 41% to 100%) were 0.9% (2/215). Lymphocyte-predominant breast cancer (LPBC) involved ≥50%. LPBC (≥50% STILs) was seen in only 9.8% of TNBCs (21of 215). The median follow-up time was 67.7 months (range: 7-159 months). The PD-L1-positive breast cancer patients had significantly longer DFS and OS values than those of PD-L1-negative patients (P=0.046; P=0.019; Figure 3). The representative pictures of TNBC cases which showed different levels of TILs were depicted in Figure 2 (A, B, C). The representative pictures of PD-L1 expression were shown in Figure 1 (A, B, C). Expressions of PD-L1 and TILs in TNBC tissues was described above. The STILs scores were found to be in a significant relationship with the PD-L1 expression patients (P=0.027). 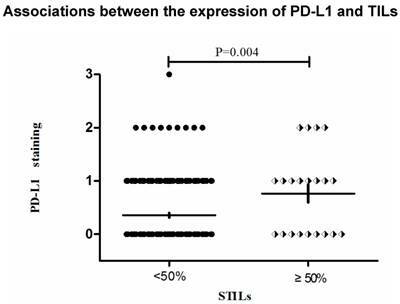 However, there was no strong association between ITILs and PD-L1. (P=0.259). The correlation between mean percentage LPBC and PD-L1 assessments was 0.013 (P<0.05, Table 2).The PD-L1 protein expression was significantly related to the presence of elevated STILs. 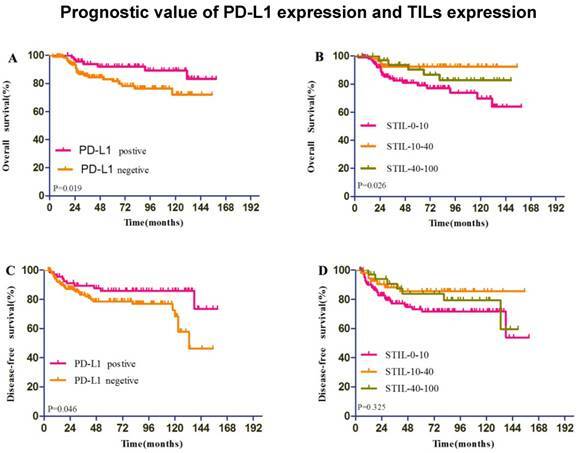 Cases with elevated STILs was presented with significantly higher expression levels of PD-L1 (Figure 4, P = 0.004, Figure 5). Upon univariate analysis, only STILs, Total TILs, Tumor size, Positive Lymph nodes and Stage were associated with death from all causes. Multivariable analysis including prognostic variables in both trials confirmed PD-L1and Positive Lymph nodes to be independent prognostic factors for DFS and OS and PD-L1and STILs to be independent prognostic factors for OS (Table 3). We reviewed the popularity and significance of PD-L1 expression in TNBC. In the study of 215 TNBC patients, the total positivity of PD-L1 was greater than 32.5%. The PD-L1 high expression was associated with STILs, LPBC and surgical methods. However, the relationship between PD-L1 expression and surgical type is questionable as no conservative surgery was performed on PD-L1 positive patients in our study, which could potentially induce an incorrect result, hence more patients should be enrolled to fully assess the connection in future studies. PD-L1 expression was particularly higher in marked-STILs patients. As our data showed, patients with negative PD-L1 expression had significantly decreased their OS and DFS in comparison to those with PD-L1 expression. Multivariable analysis had indicated that PD-L1 expression was a strong independent prognostic factor for patient prognosis and LPBC was an independent prognostic factor for OS. The experimental result showed further evidence for a biologically significant relation between TNBC and TILs. Recent research on a breast cancer clinical trial provided evidence of TILs in breast cancer and prognostic. The TNBC samples of 481 patients from Eastern Cooperative Oncology Group (ECOG) trials E2197 and E1199 were objective to appraise and investigate the density of stromal compartments and intra-epithelial TILs. Results showed that higher STIL scores were associated with better prognosis. Multivariable analysis confirmed STILs to be an independent prognostic marker of DFS, DRFI, and OS . Our results were consistent with the TILs results of this report. Anyway, immunity played a significant role in the outcome of primary TNBC. Programmed death ligand 1(PD-L1) protein expression was significantly related to the presence of elevated stromal lymphocytic infiltrates (STILs) and lymphocyte-predominant breast cancer (LPBC) which involved ≥50%. PD-L1 expression varied in different subtypes of breast cancer. A study had reported higher positive rates of PD-L1 expression in different types of tumor cells, including 20% in HER2-positive cells, 33% in luminal subtype cells and over 59% in triple-negative breast cancer cells . PD-L1 was expressed frequently in TNBC (19%). In the single published research, PD-L1 was in a cohort of pure TNBC . In our study, we showed that PD-L1 expression in TNBC occurred in 32.6% of all the patients. This different percentage of positive cases may be due to the differences in the antibody applied (5H1) in their study. The relations of PD-L1 to a poor outcome have been shown in a number of researches on mixed cohorts. The PD-L1 expression was assessed as an index of adverse prognostic factor for other pernicious cancers, for example, NSCLC, renal cancer, melanoma, glioblastoma (GBM), colon cancer, neck and head squamous cell carcinoma and ovarian cancer [21-27]. However, according to current researches on NSCLC , PD-L1 is not related to adverse prognostic factor. Colorectal cancer  and melanoma  show that a favorable prognosis is related to PD-L1 expression. A prominent immune infiltrate has been shown in these researches whereas TILs have demonstrated to be related to 98% of PD-L1-positive tumors in melanoma  and PD-L1 was greatly related to in NSCLC .The expression of PD-L1might show a relation with a TIL-mediated antitumor inflammatory response, instead of being related to tumor immune evasion. In our current study, survival analysis showed that there was a trend for poorer overall survival for TNBC patients with low expression of PD-L1 conform to a current research (Schal-per et al. ) that evaluated mRNA. Also, statistical analysis has found that PD-L1 was strongly associated with TILs TNBC cohort. PD-L1 expression was not associated with age, Intra-tumoral TIL, Tumor size Positive Lymph Nodes, Stage, Chemotherapy, radiotherapy, and Neo-adjuvant chemotherapy. There was no strong correlation between the expression of PD-L1 and clinical behavior. Despite the trend that PD-L1 expression seems to predict poorer prognosis in other cancers, the relation between PD-L1 and TNBC remains unclear. There already are argues over the topic. There already are argues over the topic. A study conducted by Tsang JYS et al. indicated a predict value of a poor prognosis on the existence of PD-L1, however, other studies showed no relation between PD-L1 expression and prognosis. Our results are opposite to the findings from the above paper. To our consideration, there might be two reasons leading to the difference between our study and others: 1) PD-L1 expression varied in different subtypes of breast cancer. OS of breast cancer patients includes all types in many studies, our study differed from Tsang's study because we focused only on TNBC patients. 2) Our result was similar to that of another study of PD-L1 on mRNA level, OS of TNBC patients with PD-L1 expressions was better than those without . The differences between our result and those reporting connection of poorer prognosis and PD-L1 expression could potentially be due to how a positive PD-L1 cell was defined. The study conducted by Mittendorf et al. assessed PD-L1 expressions merely on tumor cell membrane of 105 TNBC patients. As stated above, solely existence of PD-L1 on cell membrane may not be related to prognosis, but co-evaluation of which on both cytoplasm and cytomembrane drew the conclusion that OS and DFS was significantly improved in PD-L1 high expression patients both in our and other study . Meanwhile PD-L1 positive rate of Mittendorf's study was significantly lower than most studies on this subject , which may lead to bias in his results. A recent study also revealed that higher PD-L1 expression is related to higher PCR rate, which also indicated that patients were less likely to be suffering from poor prognosis . In current days, various agents which target on the PD-1/PD-L1 system are at various phases of clinical exploration [36-39].According to the finding of some researches, brisk immune infiltrate by TILs have been proved to associated with 98% of PD-L1-positive tumors in melanoma ; also, the TILs in NSCLC was correlated with the PD-L1 expression . It can be predicted that PD-L1 expression might be related to a TIL-mediated antitumor inflammatory reaction, instead of relating to tumor immune escape as always. This study found that PD-L1 expression and TILs in particular were biologically important in TNBC. According to recent findings by Tumeh et al. , TILs was probably basic predictor of treatment response. Our study might give support to clinical trials of this therapy in TNBC given the high expression of PD-L1 and higher STIL scores tumor compartments. Our data proved that PD-L1 was highly expressed in TNBC. The expression of PD-L1 was also correlated with the prevalence of TILs in TNBC. This study suggested that the potential of using PD-L1 was based on immunotherapy for the TNBC treatment. As an innovative and efficient treatment, immune checkpoint inhibitors are considered as a therapeutic method for RCC, NSCLC and melanoma which have been permitted by American FDA. Furthermore, clinical tests have been active in a wide scope of solid tumors, for instance, a small scale of ER-positive breast cancer and TNBC. A great amount of clinical tests in metastatic and neoadjuvant setting can determine the efficacy of immunotherapies and corresponding combinations in breast cancer. We thank all patients, clinicians, and pathologists participating in the clinical studies.